"JADE" Brand "CZ-328A" bottle-grade polyester chips are called fast reheated chips, which are suitable for making packing bottles for carbonated drinks and have been widely used by manufactures in North America and South America. During the production process, this kind of chips has the main characteristics of fast absorption of heat, lowering energy consumption, increasing output, and improving efficiency. 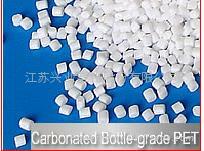 Due to the unique pricess recipe and production technology, this new product has excellent properties and leaves the main performance standards as basic Carbonated Bottle-grade Chips unchanged. The color for this kind of chips is a little bit dull, but the end products are excellent in transparency.